Haas F1 Team drivers Romain Grosjean and Kevin Magnussen qualified ninth and 11th, respectively, for the Brazilian Grand Prix Sunday at Autodromo Jose Carlos Pace in Sao Paulo. However, Grosjean will start eighth and Magnussen will start 10th as sixth-place qualifier Daniel Ricciardo incurred a five-spot grid penalty for a turbo change on his Red Bull. Magnussen set the fifth-fastest time in Q1 with a lap of 1:08.474 around the 4.309-kilometer (2.677-mile), 15-turn circuit in the city's Interlagos neighborhood. 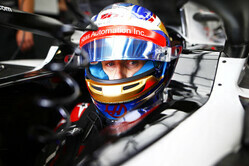 Grosjean was ninth quickest with a lap of 1:08.735. Only the top-15 drivers move on to Q2. Taking the pole for the Brazilian Grand Prix was Lewis Hamilton, who scored Mercedes' milestone 100th Formula One pole. His fast lap of 1:07.281 set a new track qualifying record at Interlagos and was .093 of a second better than runner-up Sebastian Vettel of Scuderia Ferrari. It was Hamilton's 82nd career Formula One pole, his series-leading 10th this season and his third at Autodromo Jose Carlos Pace. Magnussen ran 14 laps and set the seventh-fastest time with a 1:09.146 on his 10th tour. Grosjean tallied 16 laps and earned his best time on his 12th lap - a 1:09.257 that put him right behind his teammate in eighth. Each set their quick times on supersofts. Romain Grosjean: "We had wanted to be best-of-the-rest today, but we didn't quite get the conditions as favorable as we would've wanted. I have to say, my car in Q2 felt amazing. I went for my first timed lap, and into turn three the kill engine switch went on, so I lost the power and had to switch the car on again. I knew then I only had one attempt at a lap time, and that lap was amazing. The car felt really good. I was confident heading into Q3, but then we picked up understeer for some reason. I didn't quite get the same lap times, so we need to analyze that. With those conditions, it's very easy to get a bit of a difference and not have the same balance. I think we should be alright tomorrow. Wet or dry, there's nothing we can do about it. Let's see what tomorrow brings." Kevin Magnussen: "I'm very disappointed. It was bad luck, I guess. We were on the track when it was raining the most on my two runs in Q2. You do your best to try and go on track at the right time, but when it's going like that, you never know when it's going to start raining. It's hard to know when is the best time to go out. Clearly, we didn't get it right. I think the forecast is dry for tomorrow. It's been pretty accurate so far this week. It's just unfortunate as I think we had a very good car today. Between myself and Romain, we should have been easily best-of-the-rest. It's annoying, but let's see what positives we can get from having a free tire choice for Sunday." Guenther Steiner: "It wasn't a perfect qualifying session, but still a good one. We were just out always at the wrong time. These things happen when the weather is changing like that. The car was good and the drivers did a good job. We qualified ninth and eleventh, which should be eighth and 10th after Ricciardo's penalty, which isn't bad for Sunday. I'm sure we can fight for points tomorrow."